Duke Children's attends national Speedway Golf Tournament – McLane Company, Inc. The 27th annual Speedway Miracle Golf Tournament in Dayton, Ohio took place earlier this week. Nearly 800 golfers attended this event to raise money for Children’s Miracle Network Hospitals. Because of the generosity of several corporate sponsors, a miracle child from each of the benefiting hospitals was selected to attend the tournament and participate in special activities. Jackson Wall and his family attended as the 2018-2019 Duke Children’s Speedway Champion. 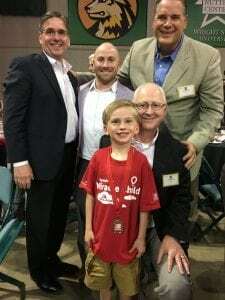 Jackson got to meet his sponsors at a formal dinner during the tournament and became fast friends with all of the gentlemen at the table. Thank you to the generous sponsorship from McLane Company that made Jackson’s trip possible! When Jackson was 14 months old, doctors at Duke Children’s diagnosed him with Pulmonary Arterial Hypertension – a chronic, progressive, and life threatening lung disease that currently has no cure. Jackson receives medication subcutaneously 24/7 via a pump and a site in his arm or back. Even with frequent visits to Duke Children’s to limit the progression of his disease, Jackson doesn’t let his condition slow him down. Throughout the golf tournament he brightened the rainy days with infectious smiles and high fives to every passing player. 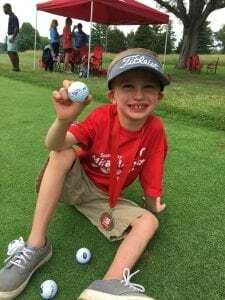 During the tournament, Jackson had a blast selling golf balls to the players for a special contest. At the end of the day, the purchased golf balls were flown up in a helicopter and dropped onto a hole – the closet ball to the hole won a cash prize. As Jackson was selling balls, some players even bought golf balls and allowed Jackson to write his own name on them – giving him a chance to win the prize! Since 1991, Speedway has contributed more than $100 million to Children’s Miracle Network Hospitals. In 2017 Speedway raised nearly $2.5 million for the kids. A portion of the proceeds from this year’s golf tournament will benefit Duke Children’s. Thanks to the support from corporate partners like Speedway, Duke Children’s is able to provide top-quality healthcare for children around the region. Thank you Speedway for another great year!